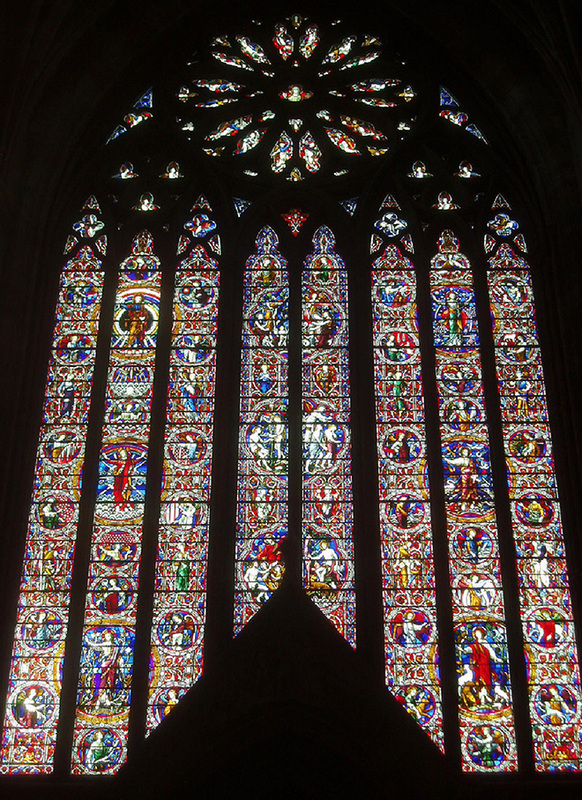 Job specification – The cleaning, repair and re-leading of the Great West Window. The project demonstrates how our large skilled workforce is unique in the UK in the ability to carry out large scale, complex restoration to the highest standards to a very tight schedule due to funding restrictions. This work will be completed on time and on budget in fifteen months. 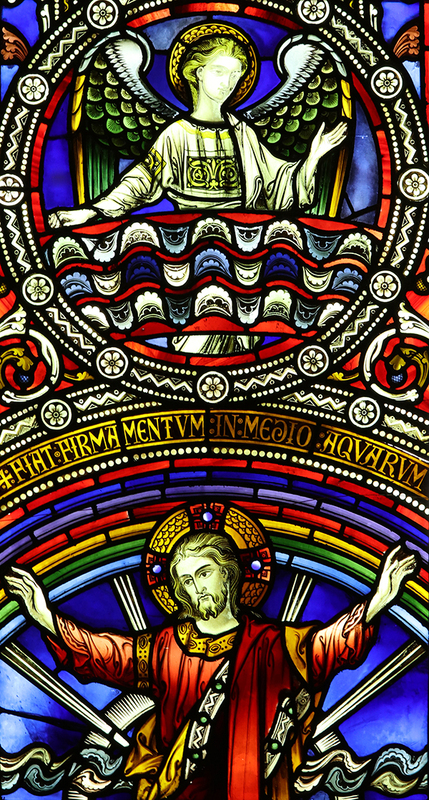 The Great West window dates from 1874 and is by John Hardman Powell of Birmingham, in collaboration with G.G Scott, the church architect. It is a fine example of Hardman’s work, and is well loved in the locality for its rich colour and lively depictions of the animals in the Creation scenes, particularly the celebrated ‘pink giraffe’. 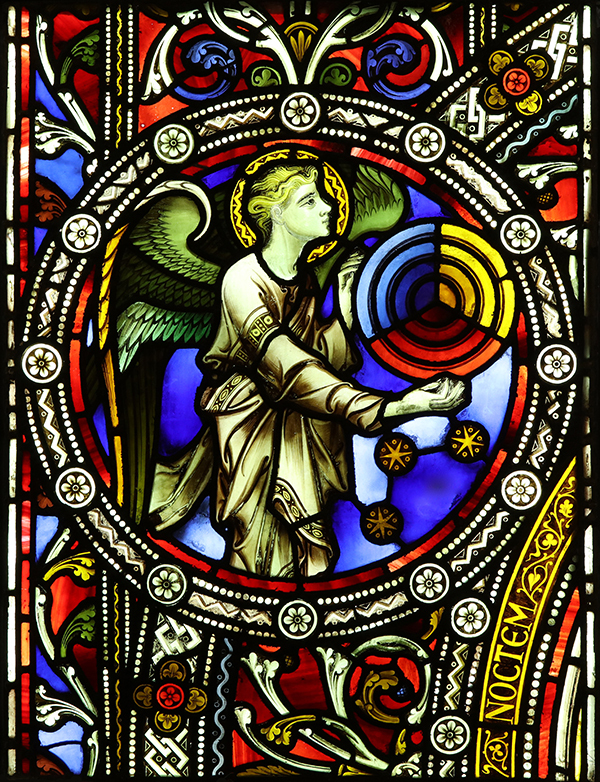 The subject is the book of Genesis, and tells the narrative of the Creation and Fall. 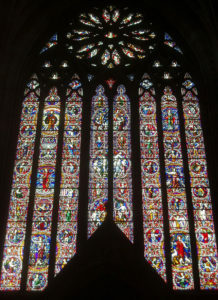 The window has eight great lights each 735mm x 8.6 metres. 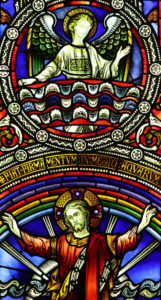 Lancets four and five terminate at a lower level than the outer lancets to allow for the 4.2 metre diameter rose window to complete the design with the Risen Christ at the centre. Inspection by HWG showed that the condition of the lead in the window was poor. Externally there was a great deal of severe buckling and bowing of panels, and many solder joints were cracked and failing. There were hundreds of breaks in the glass throughout the entire window as a result of lead buckling and additionally from local damage from air gun pellets. The window leaked seriously in heavy weather. This project is ongoing, to be carried out over 3 separate phases. All the main lights and a small number of tracery lights will be cleaned and re-leaded. 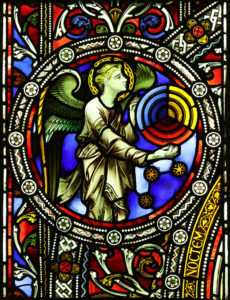 An earlier conservation project of panel 3c from the West Window, damaged by heavy impact, probably a football, effectively provided a ‘trial’ panel for the entire West Window. Removed for partial re-leading, it provided a good opportunity to study the condition of the lead work, painted detail and support structures of the window and rehearse methods. HWG are grateful for this information to Richard Thomas Barnes and cathedral archaeologist Chris Guy.